Don’t we have a Department of Transportation for these kinds of things? The government has settled on a label for gas stations selling a blend of gasoline and ethanol called E15, which contains more ethanol — grain alcohol — than the E10 blend that’s replaced pure gasoline at most stations. The Environmental Protection Agency previously approved E15 — 85% gasoline and 15% ethanol — for use in vehicles back to 2001 models. 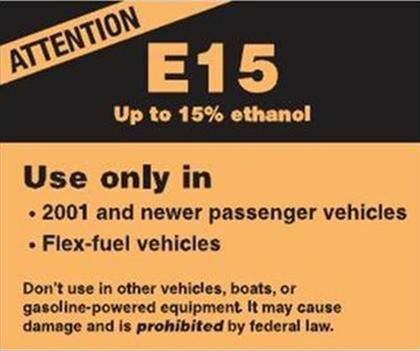 The approved label is part of the EPA’s final rule spelling out about how E15 can be sold and what standards it must meet. There’s only one problem (well, there are lots of problems with ethanol): E15 doesn’t exist. EPA says tests show E15 won’t harm 2001 and newer vehicles, which have hoses and gaskets and seals specially designed to resist corrosive ethanol. But using E15 fuel in older vehicles or in power equipment such as mowers, chainsaws and boats, can cause damage and now is literally a federal offense. Many automakers oppose the EPA’s ruling to allow E15 to be used in 2001 and newer vehicles and already they have twice challenged it. Automakers have been opposing the EPA’s approval of E15 because they say not all of their vehicles will run properly on the blend and because it potentially can void a vehicles warranty. So, the people who actually design and build cars state that not all built from 2001 and on can accommodate the blend? And use of it could void the warranties? But, don’t worry, the EPA has a sticker! Because we all know if our vehicle can take the E15 (that doesn’t yet exist). Also, automakers argue that making an E15 blend available will cause an increase in misfueling, resulting in voided warranties, fuel system damage and additional greenhouse gases. You mean use of E15 could put more GHGs into the atmosphere? Pro-Ethanol lobbying group Growth Energy argues that E15 is safe in all gasoline-powered vehicles. Let’s see: listen to the pro-Ethanol group, or the people who actually make the vehicles? Tough choice. Good thing using corn as fuel isn’t already driving up the costs of food already, otherwise, using even more corn as fuel would be a Bad Idea.